All Posts Tagged With: "LiQWD"
LiQWD is running a cool GIVEAWAY on Facebook: One winner will receive LiQWD’s entire Volumizing Line, loved by Cameron Diaz & Reese Witherspoon! How to play? Simply first fan LiQWD on Facebook. Then refer friends to LiQWD’s Facebook page with “suggest to friends” tool. Once your friend becomes a fan, you’re both entered! Contest starts today, April 12th, 2010, & ends Fri. April 16, 2010, 5pm PST. 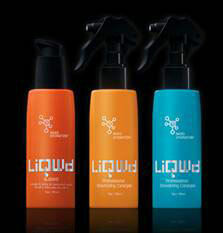 LiQWD was developed by the creators of Alterna, sold only in salons (and on liqwd.com) and is used by Cameron Diaz, Rihanna, Reese Witherspoon and Jennifer Aniston. It’s unisex and has cool packaging!